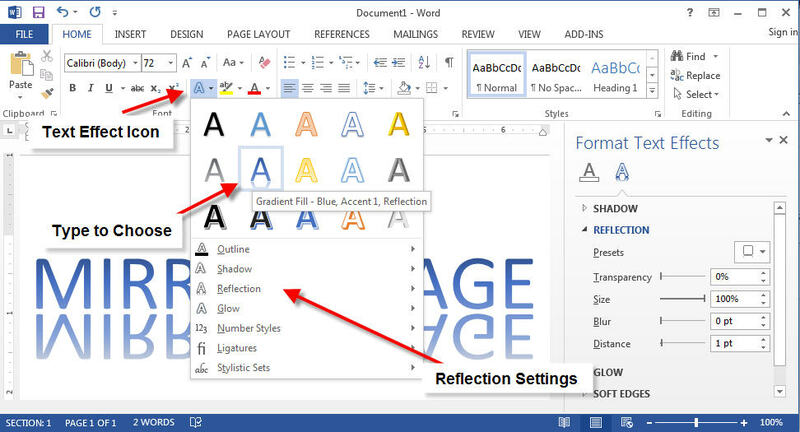 This article will discuss how to flip text so that it appears like a mirror reflection in MS Word. The task is carried out using the Word Art feature. However, the default Word Art settings will not allow you to see a full reflection, so we will work with the settings to make sure you see 100% of the reflected text. Type the desired text in Word. From the Home Ribbon Tab, click on the Text Effects & Typography icon. Select the Reflected Text option. It will be called something like Gradient Fill – Color, Accent #, Reflection. You will now see the reflected text blending out underneath your text. While your text is still highlighted, click on the Text Effects & Typography icon again. Click on Reflections > Reflections Options. Set the Transparency of the text. Lower the transparency the more clear the reflection will be. Set the size of the reflection. Entering 100% will ensure the entire reflection is shown and there is no cut off. Set the distance for the reflection. The higher the value, the further the reflection will be. Now your text will have an effect which will have a reflected text like a mirror image underneath. You can modify the Reflection Settings to change the way the reflection appears. If you wish to change the color or the font, simply highlight your text and choose a different font color. Same can be done for increasing and decreasing the font size. The above technique works with Word 2010, Word 2013 and Word 2016.